Carpenter Ants (Camponotus) are the largest ants found throughout the United States. They range in color, from black to brown, or a combination of both. Black carpenter ants are commonly found in the Northeastern side of the U.S. They have 6 legs, elbowed antennas, a slender waist and the size range from 1/4 of an inch, to 1/2 an inch for a worker ant, and 3/4 inch for a queen. Black Carpenter ant swarmers emerge from a mature colony usually beginning in early spring (May) through the summer. The carpenter ant swarmer's has 2 pair of wings, but the second pair are shorter than the first. Carpenter Ants can cause serious damage to wood inside and outside your home. Unlike termites that eat wood, carpenter ants excavate galleries and build nests to rear their young. This is especially harmful in wood support members such as sill plates, floor joists, rim joist, posts and beams, to mention a few. They can be found in logs, firewood, moist damp wood, and tree stumps. Though they can be found in dry wood, carpenter ants prefer wood with a high moisture content. The longer the colony stays in the wooden structure, the more damage they will do to your home. Over time any structural wood they attack can be weakened, resulting in unlevel, or sagging floors, bulging walls, or worse. 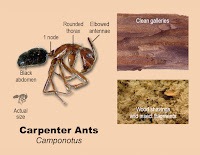 Debris that carpenter ants produce from excavating wood, such as saw dust like shavings mixed with body parts of dead ants, is a clear indication of a nearby nest. 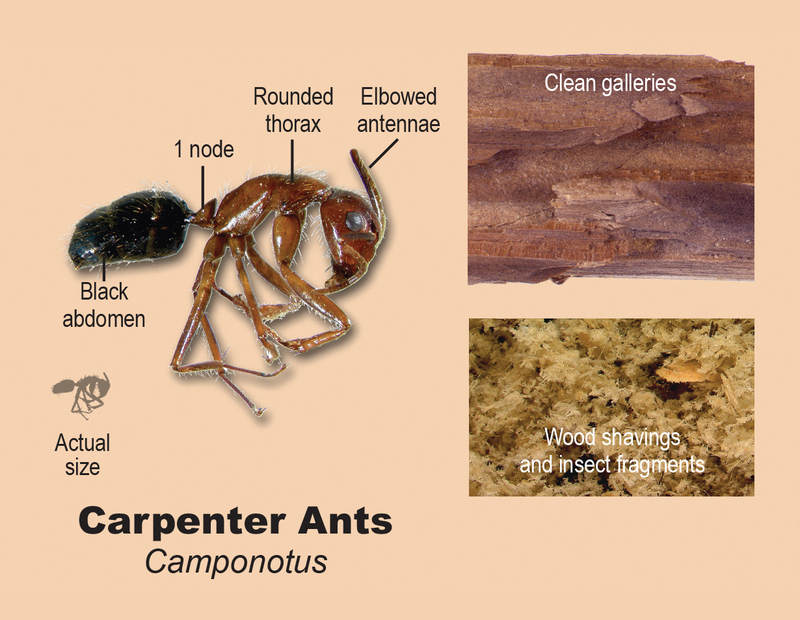 Carpenter Ants are usually found near moisture, and rotting or decaying wood. Home owners should make sure their gutters and downspouts are functioning properly. If holes or leaks exist in the gutter system, that can allow rain water to accumulate around the home, thus attracting carpenter ants. Replace all dysfunctional gutters and downspouts. Adding downspout extensions, or splash blocks is also helpful in keeping water from accumulating around the structure. The grading around the structure should slope slightly to allow rain water to drain away, instead of toward the structure, or from settling around it. Where wood is in contact with soil, these areas should be closely examined. If nests are discovered, replace the infested wood if seriously damaged. Exterior steps, posts, or railings should rest on concrete pads instead of in, or on the soil. Stopping water from entering the home is very important. Repair all roof leaks and replace missing shingles if needed. Have the flashing on the roof inspected, especially roof penetrations such as plumbing vents and chimney flashings. Clean gutters of leaves and dirt to prevent them from overflowing. Caulk and screen any potential entryway ants may use to gain access, like doors and windows, and outside water connections. Ventilate areas where moisture accumulates, or where high humidity exists, such as crawlspaces, attics and storage rooms. Vegetation in the form of bushes, hedges and tree branches should be trimmed back at least one foot away from the exterior walls, and tree branches overhanging roofs should be cut back. When vegetation is in contact with exterior walls, or roofs, this is conducive for pest infestation. While wood mulch is good for plants, it also attracts wood destroying insects, including termites. If you have wood mulch, or plan to have some put around your home, many pest control professionals strongly recommend having the mulch treated to prevent the infestation of wood destroying insects. Wood mulch can be sprayed, or granular bait can be applied. Carpenter ants have their place in nature, however, we don't want them in and around our homes. With careful planning, and good home maintenance and repair, we can reduce the use of pesticide and co-exist with the insect world.